Boston Red Sox players blasted manager Bobby Valentine to owners John Henry and Larry Lucchino during a heated meeting called after a text message was sent by a group of frustrated players to the team and ownership in late July, three sources familiar with the meeting told Yahoo! Sports. The owners called the meeting for Boston's off-day in New York on July 26 after first baseman Adrian Gonzalez, texting on behalf of himself and some teammates, aired their dissatisfaction with Valentine for embarrassing starting pitcher Jon Lester by leaving him in to allow 11 runs during a July 22 start. It was the latest incident in a season's worth of bad relations bubbling between Red Sox players and Valentine. Gonzalez and Dustin Pedroia were among the most vocal in the meeting, in which some players stated flatly they no longer wanted to play for Valentine, the sources said. The tenor of the 2 p.m. meeting at The Palace hotel in New York turned ugly almost immediately, according to the sources, whom Yahoo! Sports granted anonymity because they were not authorized to speak about internal matters. Not all of the Red Sox players attended the meeting, the sources said, highlighting the chasm that exists not only between some players and Valentine but among players in the clubhouse. The perception that Valentine is being scapegoated unfairly to divert attention from mediocre performances by star players exists among some players, according to sources. Red Sox general manager Ben Cherington confirmed the meeting. Although he declined to provide specifics about what was said, he told Yahoo! Sports: "The intent of the meeting was to provide a forum for people to express whatever frustration needed to be expressed at a time during the season when things were not going exactly the way we wanted to on the field in hopes that we could put whatever issues were there aside and focus on playing games the rest of the season. That was the intent of the meeting. That was the focus of ownership. It was a productive meeting. "Since then, we have not gone on the run we were supposed to." Ownership has not wavered in its support of Valentine since the meeting, and the sources said players have accepted that Valentine will remain manager for at least the rest of the season. The Red Sox doubled down on Valentine over the last week despite the perception that his first year as Boston manager has been an abject failure. Boston, with an opening day payroll of $173.2 million, is 57-59 and sits 11 games back of the first-place Yankees and 5½ behind the second wild card. The Red Sox's last sub-.500 season was in 1997. Eight days ago, besieged by questions about Valentine's present and future, Red Sox general manager Cherington told reporters: "Bobby is our manager, and we're not considering anyone else. He's as committed to managing the team as he ever has been, and we're committed to him and trying to do everything we can to support him and make this work." Henry emailed a statement to Boston media members that echoed the sentiment. 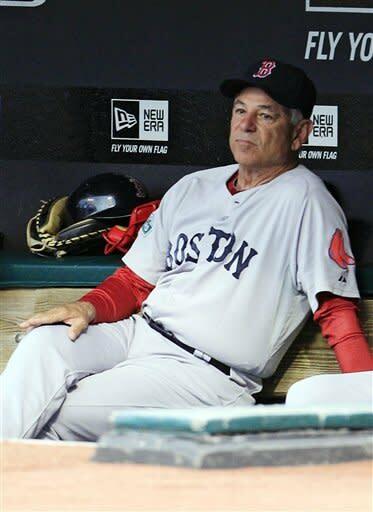 "To blame Bobby Valentine for the Red Sox being .500 at this point in the season," he wrote, "is simply wrong." Some of the Red Sox's biggest names disagree. Issues that have inflamed players range far and wide. Leaving in Lester, a well-respected figure in the clubhouse, to get blasted for 11 runs and four home runs against Toronto soured players already beaten down by Valentine's managerial style. Valentine uttering "Nice inning, kid" to rookie third baseman Will Middlebrooks after he made a defensive blunder – an episode to which Valentine admitted on WEEI radio – only furthered the animus toward the 62-year-old, who is managing in the major leagues for the first time since 2002. Since spring training, players have chafed at Valentine's careless – and occasionally self-serving – interactions with the Boston media, which his predecessor, Terry Francona, handled adroitly. "I don't think it's that uncommon for complaints to be made during the season," Cherington told Yahoo! Sports. "I'm not going to comment specifically on those complaints. Our owners felt, given where we were at that time in the season, given the collective frustration, we had not accomplished what we wanted to. It was time to get together and hash things out. There were no ultimatums issued. There were concerns expressed. Some very positive things expressed, too. We felt that it was an opportunity to get things off people's chests and move forward." From the beginning of the Red Sox's courtship of Valentine this offseason to the double-barreled votes of confidence last week, the match of the hard-nosed Bobby V with the laissez-faire Boston clubhouse seemed tenuous at best. It has proven far worse, personified best perhaps by a picture circulating around via text message, according to a fourth source. Pedroia, notorious among teammates for his wit and humor, is in the foreground with a giddy smile, his tongue wagging and both thumbs up. Next to him is allegedly Valentine, face down on a table, apparently asleep. A caption accompanies the picture: "Our manager contemplating his lineup at 3:30 p.m."
A general lack of respect for Valentine has pervaded the clubhouse throughout the season. It may have peaked two days after the meeting, on July 28, when Francona entered the Red Sox's clubhouse as an ESPN analyst. 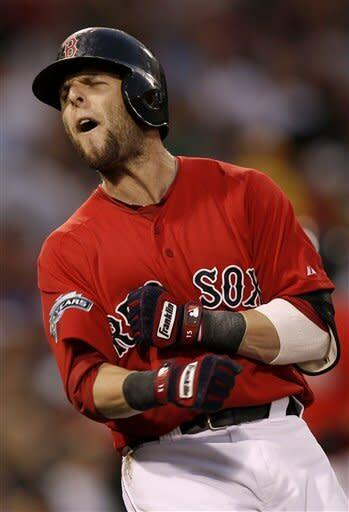 He started talking with Pedroia, his most strident loyalist. Other players soon joined the conversation, which lingered for 45 minutes. Francona apologized the next day. The Red Sox's tumultuous year started with their collapse last September, followed by the team declining to re-sign Francona. After general manager Theo Epstein left to run the Chicago Cubs, Cherington, one of his assistants, took control of the team – until Lucchino wrested the managerial hire from him. Ownership picked Valentine and Cherington rubber-stamped it, hopeful the organization could grow cohesive over the two-year span of Valentine's contract. Instead, the Red Sox have splintered, not a shock considering Valentine's history of divide-and-conquer management. For all of his supposed strategic genius, Valentine wore out his welcome managing the Texas Rangers and New York Mets because of his willingness to napalm personal relationships. It led to a decade-long exile from the major leagues, most of which he spent in Japan. Valentine returned no different a manager. He barely talks with some of the coaches on his staff, several of whom remain Francona supporters. The trade of Kevin Youkilis, the World Series fixture who first exposed fractures between the players and Valentine, devolved into a public-relations mess. Then there are the oddities, like Valentine devising a plan to never play outfielder Carl Crawford more than four days in a row because of an elbow that may need surgery, only to abandon the idea less than a week later. Certainly the concoction of losing and an unfamiliar style has hurt Valentine's standing with players. Ownership remains in Valentine's corner, with Henry saying in his statement eight days ago: "We have been nothing but supportive of him inside and outside the clubhouse." The support, according to the sources, baffles those against Valentine, who wonder why the meeting was called if it wasn't going to change anything. During the meeting, the players told Henry and Lucchino that part of the disconnect comes from Valentine spending excessive time in his office. He'll retreat there again Tuesday, when Boston takes on Baltimore at Camden Yards, still wearing a Red Sox uniform, still running one of baseball's great teams, survivor of a mutiny.